score goal; this was his equalizer. With usual recap writer Sean out of town, he asked me (the preview writer) if I would be willing to write this week's recap. He also added, "I guarantee you that with my luck, you'll get to write about a big 5-0 win." After 23 minutes, it looked like Arsenal might have been well on their way to a big, emphatic, and comfortable victory along those lines, something that was sorely needed after the last few weeks of form. Instead, we've ended with more questions than answers, following a ridiculous roller coaster of a match. I mentioned in my preview that Arsenal right now seems like a team that needs more psychological help than new players. On Tuesday in Germany, Arsenal looked beaten through the first 15 minutes, got a goal, extended that lead to 2-0, played great football for almost half an hour, capitulated before halftime, then went through the motions in the second half, to end with a 2-2 draw. Today was shockingly similar. Fulham started off with the better of the possession, but it was the home side who opened the scoring. Theo Walcott won Arsenal's first corner, which he took himself. His outswinging kick met the thumping header of Olivier Giroud, who beat his man Aaron Hughes from six yards out. Mark Schwarzer got his hand on it, but couldn't keep the forceful header out of the back of the net. 1-0 to the Arsenal after 11 minutes. Not too shabby. Fulham went straight back on the attack, but Arsenal caught a break when left winger Kieran Richardson, who missed last week's match with food poisoning, pulled up lame with a hamstring problem. With Richardson on the sideline receiving treatment, Arsenal went back on the attack against ten men. A short throw-in found Arteta, who himself found some space in the box, then neatly crossed to Lukas Podolski, who buried a shot from the six yard line. It was shocking defending from Fulham and it was 2-0 to the Arsenal. Just like on Tuesday. shall we?!? Berbatov scores his first from this set piece. It certainly felt like Arsenal was well on their way to the drama-free and comfortable victory they so desperately needed. But, just like on Tuesday, one mistake starting the unraveling process. Despite trailing 2-0, Fulham were playing well, and given the manner in which Arsenal have struggled lately, you had to figure Fulham could find a breakthrough sooner or later. In the 29th minute, the Cottagers won a corner, from which the cross found the head of an unmarked Dimitar Berbatov and the Arsenal defenders stood nearly still as he pulled a goal back. After the match, we likened Arsenal to a house of cards. One mistake sends the confidence crashing to the ground again. 11 minutes after getting a goal back, Fulham were level, and this one was really poor from Vito Mannone. The Italian had been performing well as of late, including last Saturday when he was Arsenal's best player at Old Trafford. A Berbatov cross found Alex Kacaniklic unmarked in the penalty area and the substitute, who had come on for the injured Richardson, fired home the equalizer. It had looked like Mannone went the wrong direction first, meaning he could only palm the ball off the post and in after going back in the correct direction. All things considered, it was a stoppable shot, one Mannone should have saved, but Kacaniklic should not have been so open in the first place. Five minutes later, Fulham nearly struck again, but a shot dribbled just wide after some more shambolic defending, though a Per Mertesacker touch on the ball kept it from being an easy tap-in for Berbatov. At halftime, the scoreline stood at 2-2. After coming back to tie the score at 2-2 on Tuesday, Schalke turned off the pressure a bit; they were happy to get a point out of the match and so was Arsenal. The rest of the match after Schalke's second goal was largely academic. That was not the case today. Olivier Giroud nearly put Arsenal ahead on 51 minutes from a Walcott cross, but the ball was a touch too high and Giroud's jump was a touch mistimed. About five minutes later, Arsenal made their first substitution, and it was a baffling one, removing Coquelin for Aaron Ramsey. Now, I didn't see any signs that Coquelin had picked up an injury, so it's bizarre to see Arsene Wenger make a sub before the hour mark like this. I personally wasn't too happy with how the substitution shifted things in midfield. Ten minutes later, Fulham went ahead. Mikel Arteta was caught being lazy in possession just outside his own penalty area by Bryan Ruiz, who surged forward with the ball, got clipped by the Spaniard, and went down. In real time, I thought it was a stone cold penalty; on replay, it was not nearly as egregious, as Ruiz went over very easily. Berbatov buried the spot kick in almost unbelievably nonchalant fashion, freezing Mannone, to make it 3-2. 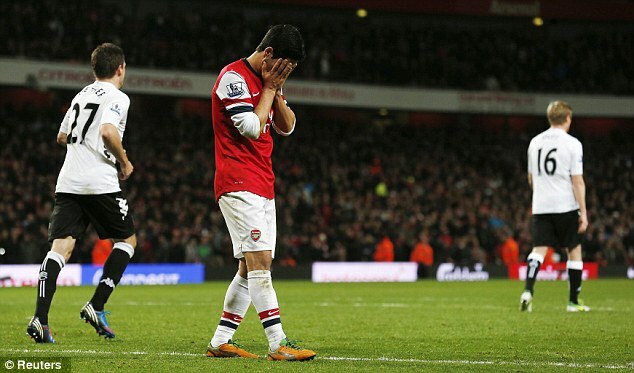 Arsenal's capitulation was complete, but they would not go down without swinging back. Two minutes later, Giroud was clear through on goal, but his shot hit the goalpost and rebounded out to the right wing. There, Theo Walcott collected it, crossed it back into the middle, and Giroud headed home to pick up his first brace in red and white, leveling the score at 3-3. So, for the big Frenchman, that makes six goals in his last nine games for club and country. I've long been of the belief that goals will come for him, because he seems like he knows where to be at the right times; he just hadn't been getting the service. Today, he got that service, and finished two of them brilliantly. From there, the confidence seemed to be back and Arsenal poured forward looking for a winner. Alex Oxlade-Chamberlain and Andrei Arshavin were brought on late to try to bolster the attack, but it looked like another goal wasn't coming. Then, in the fourth and final minute of injury time, an Arshavin cross struck the arm of Chris Baird and Phil Dowd pointed to the spot. Penalty to Arsenal at the death with a chance to win. It was a poor decision, as Baird was in the process of pulling his arm away in an attempt not to handle, so how you can call that intentionally handling is beyond me. On top of that, Arsenal were not necessarily the better team on the day over the course of the full match, so winning it controversially did not seem like it should have been in the stars. Mikel Arteta stepped up and with the final kick of the game, he fired toward the bottom corner, and Mark Schwarzer made an excellent diving save to preserve the draw. Arsenal did not deserve the win, but oh boy, I would have taken it. Where do you even begin trying to make heads or tails of a match like that? Arsenal have always been a streaky team, in terms of form: win a few games in a row, then struggle for a while, then pick it back up again, etc. Now, they're starting to get into these streaks within a single game itself. On Tuesday, they struggled out the gate, then jumped out to a 2-0 lead, then let it go. Today, they did all of that again, but earlier in the match this time, then fell behind 3-2, only to come storming back, draw level, earn the chance to win it with the final kick of the game, then waste that chance. Absurd, isn't it? In the grand scheme of things, Fulham at home, for a club with Arsenal's ambitions, needs to be three points. You can't take a moral victory from coming back from 3-2 down when you put yourself there from 2-0 up in the first place. This is starting to look like a team that can't win if they make a mistake at any point; that they'll need to play 90 perfect minutes to put any sort of result together. Frustrating times. The last time we were all this down, it was after losing to Milan 4-0 and Sunderland 2-0 in the FA Cup in February. The next match after that was the North London derby at the Emirates, when the season finally turned around. And, what do you know? That's the next fixture this time around, too. Ratings (I've been careful to use Sean's Base-7 system here): Mannone 5, Sagna 5, Koscielny 6, Mertesacker 6, Vermaelen 5, Arteta 4, Coquelin 6 (Ramsey 5), Cazorla 7, Podolski 7 (Oxlade-Chamberlain 6), Walcott 8 (Arshavin 7), Giroud 8 [MOTM]. All images via Daily Mail.